Most employers (83 percent) say the Affordable Care Act is driving up the costs of their employer-sponsored health plans. A quarter (25 percent) say they are considering abandoning their health insurance plans altogether. This is according to a new survey by Cherry Bekaert Benefits Consulting. Employers say the ACA is driving costs higher, with 83 percent saying the ACA will continue to put upward pressure on their health plan costs. The ACA has impacted hiring practices with one out of four respondents hiring more part-time workers. Nearly 25 percent of respondents say they are considering the elimination of their employer-sponsored health insurance plans, with 5 percent saying they have already made the decision to do so. Increasing costs of health insurance plans are affecting other employer sponsored benefits such as reductions in dental, vision, and life benefits. 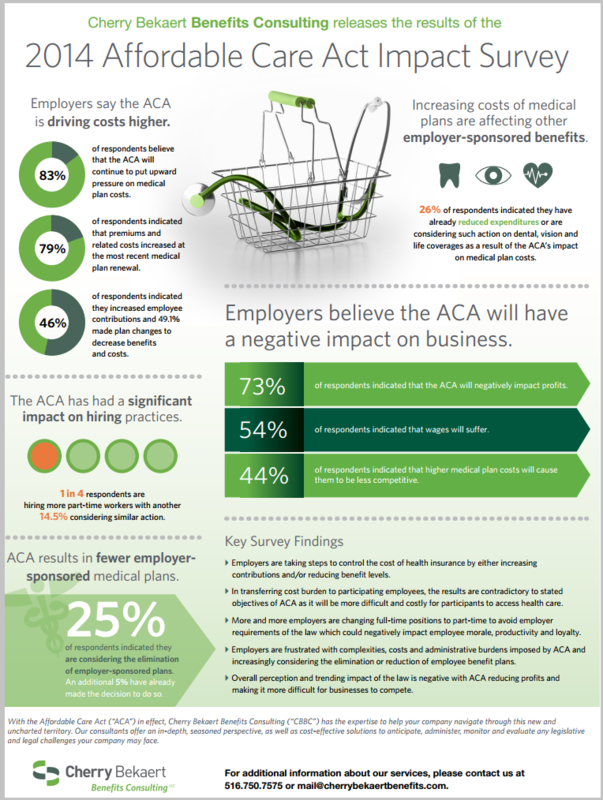 Employers believe the ACA will have negative impact on business; 73 percent of respondents indicated that the ACA will negatively impact profits and 44 percent indicated that higher health plan costs will cause them to be less competitive. Those in the health insurance, employee benefits, and human resources industries may not be surprised by these results. Many employers are facing double-digit premium increases this year at renewal time causing employers to question how they offer health benefits. Additionally, there are advantages to individual health insurance causing employers to think outside of the box. For example, a separate analysis by S&P Capital IQ predicts that 90% of employers will abandon employer-sponsored health insurance by 2020. Survey and Infographic Source: Cherry Bekaert Benefits Consulting.